The New York State Department of Corrections is responsible for the incarceration and subsequent rehabilitation of more than 53,550 inmates across 54 state facilities. These men and women are supervised by 28,441 correctional officers who are sworn to foster an environment where offenders, staff, and the community feel secure while implementing treatment plans to support each inmate on their journey back to freedom. Additionally, the county jail system, consisting of facilities like Allegany County Jail and Broome County Public Safety Facility uses state funding and resources. Finally there are four federal penitentiaries in New York that also require funding and support from the state. With the evolving needs of the corrections industry, it is no surprise that the Bureau of Labor Statistics predicts an upward trend in job creation throughout the state. Total roles for front line correctional officers are expected to exceed 29,863 in total by 2022. Between this forecast and vacancies due to retirement, attrition, and promotion, the state of New York has mounted an active campaign for recruits. To learn more about corrections in New York, read on. CUNY John Jay College of Criminal Justice ranks 1st in our rankings with a thousand students completing programs in criminal justice and security and loss prevention services out of a total 5,976 graduates. Hilbert College ranks 2nd in our latest rankings with 101 students graduating from programs in law enforcement administration, criminal justice, and criminal justice out of a total 522 students from the 2012-2013 school year. SUNY College of Technology at Canton ranks 3rd in our rankings with 175 students graduating from programs in law enforcement administration, security and loss prevention services, and criminal justice out of a total a thousand graduates from the 2012-2013 school year. An essential educational resource for the Auburn, New York area, Cayuga County Community College is an affiliate of the State University of New York (SUNY) Network. With foundational values of diversity and affordability, CCCC strives to create engaged citizens who are career-ready. To this end, the college has an array of programs for students interested in Criminal Justice associate's and bachelor's degrees. Use of instructors who are veterans of their field as well as smaller class sizes ensures students enter the field prepared for its challenges. Ulster County Community College ranks 5th in our latest rankings with 74 students graduating from programs in law enforcement administration and criminal justice out of a total a thousand students. Keuka College ranks 6th in our rankings with eighty-eight students graduating from programs in law enforcement administration out of a total 1,278 students from the 2012-2013 school year. Herkimer County Community College ranks seventh in our latest rankings with 67 students graduating from programs in criminal justice, law enforcement administration, and corrections out of a total a thousand students in the 2012-2013 school year. Jamestown Community College ranks 8th in our rankings with 81 students completing programs in corrections, criminal justice, and law enforcement administration out of a total a thousand graduates. Located in Queensbury, New York, Adirondack Community College is part of the SUNY college network, serving students throughout the New York state. A public 2-year facility with over 2,500 full-time, on-campus students, ACC specializes in offering affordable and accessible certificate and associate's programs to the area. Students interested in pursuing a career in corrections are encouraged to apply to ACC's associate degree program for Criminal Justice - Police Science whose program facilitates entry into the enforcement field. Jefferson Community College ranks 10th in our rankings with sixty-six students graduating from programs in law enforcement administration out of a total 1,236 graduates in the 2012-2013 school year. Schenectady County Community College ranks 11th in our rankings with 60 students graduating from programs in law enforcement administration out of a total a thousand graduates in the 2012-2013 school year. St Thomas Aquinas College ranks 12th in our latest rankings with 33 students completing programs in law enforcement administration out of a total 672 students. Clinton Community College ranks 13th in our latest rankings with 38 students completing programs in criminal justice out of a total 780 graduates. Erie Community College ranks 14th in our latest rankings with 232 students completing programs in law enforcement administration and criminal justice out of a total 4,934 students. Columbia-Greene Community College ranks fifteenth in our latest rankings with 33 students completing programs in criminal justice and law enforcement administration out of a total 706 graduates. LIU Brentwood ranks 16th in our rankings with fifteen students completing programs in law enforcement administration out of a total 322 students in the 2012-2013 school year. North Country Community College ranks 17th in our latest rankings with twenty-five students graduating from programs in law enforcement administration out of a total 560 students from the 2012-2013 school year. Orange County Community College ranks 18th in our rankings with seventy students completing programs in criminal justice and law enforcement administration out of a total a thousand graduates in the 2012-2013 school year. Onondaga Community College ranks 19th in our latest rankings with 104 students graduating from programs in criminal justice and law enforcement administration out of a total 2,590 graduates. Genesee Community College ranks 20th in our rankings with seventy students graduating from programs in law enforcement administration out of a total 1,746 students. Veterans to have proof of DD-214 "Honorable Discharge"
Candidates who pass the assessment portion of the hiring process will be contacted for an in-person interview. After a successful interview, applicants will be enrolled in basic training to take place at a state facility. The focus of training for new hires is on practical measures and tactics for the corrections officer role. Employment will be finalized upon successful completion of the final phase of training. The Department of Corrections in New York state encourages civic-minded citizens to look toward the corrections field for lucrative career opportunities. 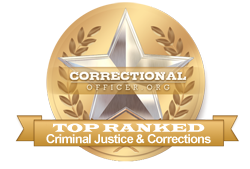 At this time, the median income for correctional officers throughout the state is higher than the national average at $63,600, with the national median income at $39,800, however according to occupational data for the state, available at http://www.careerinfonet.org/occ_rep.asp?next=occ_rep&Level=&optstatus=011000000&jobfam=33&id=1&nodeid=2&soccode=333012&menuMode=&stfips=36&x=24&y=18 and published by CareerInfoNet.org, state trends will experience a -1% decline in growth from now until 2022. This projection translates into 1,020 openings from existing positions annually. The table below lists career information retrieved from the Bureau of Labor Statistics for correctional officers in New York. The table is sorted by total employment, with the largest metropolitan areas listed first.